Much as corporate shareholders seek positive growth in their financial portfolios, volunteers and donors want to see their investment in good causes reap rewards in the form of a social return on investment or volunteer ROI. What better way to help volunteers understand the breakthroughs they’ve made than by reviewing what’s been accomplished? An “Impact Portfolio” is a perfect vehicle to share the news. Estimate your volunteer Return on Investment (ROI) in as little as 10 minutes! Volunteers are so much more than an extra pair of hands. They add value in many ways. Isn’t it time for a full accounting for their true worth? 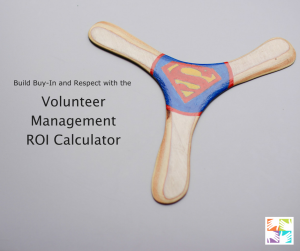 Our VolunteerPro Return on Investment (ROI) Calculator makes it easy. All you need to get started are some rough estimates of your program costs and volunteer hours. The formulas are baked in, so you don’t have to do the math. What is an Volunteer Management Impact Portfolio? Your effectiveness and ability to stretch program contributions and resources matters to many different stakeholders – executive leadership, members, volunteers, the community, etc. Now it’s time to show them what you’re worth! Similar to annual reports distributed by most nonprofits, an Impact Portfolio tells the story of your organization‘s work on behalf of the community. In a more focused way, however, an Impact Portfolio can depict the impact of a single program or the volunteer services department. It can shed light on the collective experiences of clients, volunteers, staff, your community, your founders, and others who are affected by your work. While the format and content for an annual report is generally bound by tradition, an Impact Portfolio can serve as a program’s evergreen virtual scrapbook. It can include photos, videos, testimonials, data, infographics, etc. that are updated regularly and continuously document what occurs when a group of caring people work in partnership to make the world a better place. Similar to a Facebook newsfeed, an Impact Portfolio can keep your supporters in the loop on your program’s life changes. For the leaders at your organization, you can demonstration how you have realized your mission in concrete ways through effective volunteer management. As the name implies, an Impact Portfolio should focus on the outcomes brought about by your program and volunteers, rather than general news, updates, and requirements. Given your mission, what has changed because of the work of volunteers and program staff? How is the world a better place, specifically? An Impact Portfolio can vividly bring to light transformation and renewal versus focusing on the status quo. It might also include areas of challenge and focus. If you don’t have immediate access to an online environment, you can compile your Portfolio into a three-ring binder, but why limit yourself? There are plenty of free and low-cost software options that allow you to upload, house, and share your documents. If your IT department has the time to create a maintain a page on your agency’s website, that’s great. If not, try setting up your own wiki. Give staff and volunteers access so that they can upload their own contributions to the Portfolio. Or, set up a Facebook page focused entirely on your stories of change. Share your Portfolio publicly. And, whatever platform you choose, be sure to link to it from your agency’s webpage and include the web address in your brochures, fact sheet, and volunteer application materials, so that it can be found easily. Also, be sure to enable social sharing widgets so readers can share the good news with others inside and outside your organization.